A lot of deal hunters like to use social websites like Facebook as a way to find coupons and discounts from their favorite retailers. Facebook responded by starting up the Facebook Offers program in 2012, but at the time it was designed mainly for desktop computer users rather than for mobile phone users. As the number of people opting to use their mobile phones for deal hunting began to skyrocket, it became apparent to Facebook that it was time to redesign the program to improve user experience and offer more promotional options for advertisers.The newly improved Facebook Offers is now a spectacular mobile-tailored program that makes it easier to find the coupons on Facebook users to find the coupons that they want and access them when they are ready to redeem them. With the newly launched program, advertisers can design Offers for use online or in-store. The Offers are shared either through an ad or the retailer's business Facebook page. People hunting for Offers from their favorite retailers will find it much easier to find current and previously posted Offers. All they have to do is go to the retailer's Facebook page and look for the newly designed "Offers" tab, click on it, and all Offers posted by the retailer will be there. Claiming an offer on the computer or a mobile phone has also been simplified. After viewing the Offers listed under the tab, users select the Offers that they are interested in, click on the button marked "Get Offer" and the coupon is automatically saved to a new Offers bookmark. Anytime a person wants to look at their saved Offers, all they have to do is click on the bookmark. For in-store, the process has been greatly simplified. 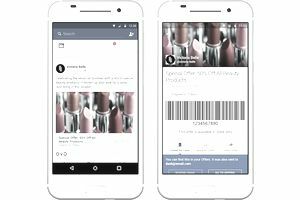 Shoppers can access the Offers bookmark from their mobile phone, find the Offer that they want to redeem, and then present it to the cashier via their mobile device so that it can then be scanned. The in-store Offers will have either a barcode or a QR code to scan, depending on the retailer's preferences. Reminders is another new feature of the revamped Facebook Offers program. It is designed to remind people of the Offers that they have claimed. For example, if they claim an Offer on their mobile device, they will receive a reminder when they log in to Facebook from their computer. It will also remind people of the Offers that they have claimed that are about to expire. This is the one feature that has the potential to become annoying, especially for people who keep several Offers in their bookmarks. Claiming too many Offers and allowing them to accumulate is something coupon users will want to keep in mind. One feature that Facebook is being designed that will be more pro-advertiser than pro-couponer are the unique offer codes. Currently, Facebook Offers are designed with one offer code or barcode for every claimed Offer. This allows people to share the coupons with friends, which is something many coupon users enjoy doing. In the future, Facebook will offer retailers the choice of creating Offers with unique codes for each person that claims the Offer. This means that the Offer cannot be shared or broadcasted on a large scale. The program has been streamlined so that it works on home computers or mobile devices. People will no longer have to spend time scrolling endlessly to find an Offer. The Offer tab simplifies the process of finding new and old offers on a retailer's Facebook page. There are easier options and faster processes for redeeming Offers. Reminders could get out of control. Unique coding prevents sharing coupons. Facebook has devised an Offer program that is well designed and benefits both the advertisers and the users. It especially benefits those users who want to shop particular retailers where they will find coupons that they will actually use.